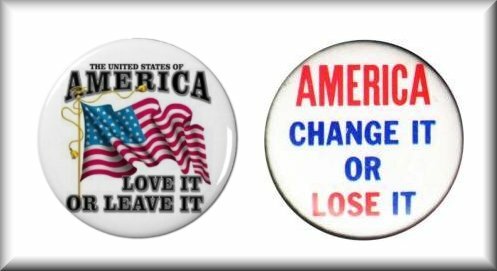 The above buttons represent sentiments that were commonly seen as bumper stickers during the Vietnam War era. The former was by far the most prevalent, but the latter could be seen on the vehicles of anti-war activists. Then, as now, political polarization was the rule rather than the exception. Now that’s a really catchy song, and she makes some good points about government transparency, money and special interests taking precedence over the voice of the people, and similar things – but it still sends a strong message: If you don’t agree with our philosophy, you are less-than and not welcome in this country, and you had best get out. These are my grandparents. 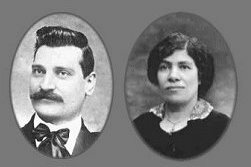 They immigrated to this country in around 1900, came through Ellis Island, settled in the great metropolis of New York, and raised a family. They worked their butts off, and although they never were terribly successful at learning English, their kids went to school and did, and became honorable and productive members of this society, all the while injecting some wonderful Italian flavor into the world around them. 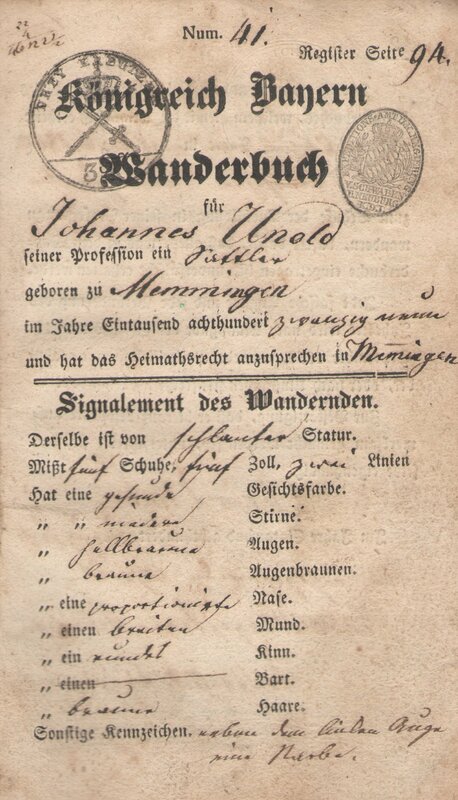 This is the cover page from the Wanderbuch (sort of a hiking journal) of my wife’s great-grandfather, who was born in Bavaria and who came to this country in around 1850. My wife’s father spoke no German, so it’s a good bet that the descendants assimilated well, all the while bringing some German feelings, attitudes and philosophies to the general mix. The thing about the many waves of immigrants that washed upon our shores is that they came to enjoy and appreciate the freedoms and opportunities that our land has to offer, and were not intent on re-making this nation in the image of the lands of their birth. Immigration has not been without challenges, and I’ve written about some of the specifics before. Strict interpretation of the “love it or leave it” philosophy can lead to such atrocities as Japanese internment camps, which must never again be allowed to happen. That said, no group who has come to our country must ever be allowed to re-cast our basic laws and/or constitution to suit their particular ideology – any such attempt must be doomed to failure. On the other side of the coin, America has changed since its inception. The founders had enough foresight to place into the Constitution a way of changing it, but it had to be a difficult way that made sure any changes reflected the will of the people. It’s not easy to get an amendment passed, but it has happened – and mostly for the good. The Bill of Rights. Emancipation. Voting rights. And 24 others. Over time, change must happen or a nation stagnates. I firmly believe it’s time for our nation to move forward into the 21st century in spirit and not just in calendar date. There are far too many things still wrong in our country; unequal opportunity, the persistence of racism, over-militarization of police departments, a deeply entrenched culture of misogyny, and a continuing belief by those in power over our lives that fighting for “truth, justice, and the American Way” involves running roughshod over other nations to plunder their resources and subvert their cultures to our benefit. 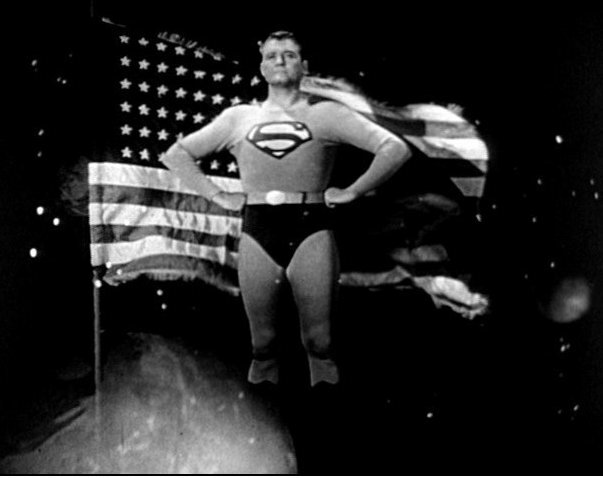 The above clip is part of a show… how I wish it had been a real speech. And it’s not perfect, because it ignores the economic terrorism that was going on under our noses during the great period of history that was being referred to. But it brings up some critical points, and casts the harsh light of reason on areas where our country needs improvement. Unadulterated “Love it or Leave It” implies a nation that works for only a very restricted subset of our population, and not for everyone. 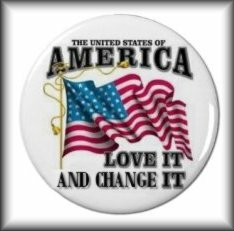 Rigorous “Change it or Lose It” fails to focus on the things that have made and continue to make our nation a desirable destination for many of the world’s citizens. Those of us who have been blessed with American citizenship by birth, and those who seek to become members under that head, need to have a deep and abiding love for the Constitution of our land and the principles upon which it was founded. But we also need to take a hard look at our country and make a concerted effort to change the things that only work for a few and exert downward pressure on the many, all the while maintaining and defending those parts of our heritage that (in a positve way) set us apart for so long from the rest of the nations of the world. Education is key. We need to raise new generations of people who are wanter/needer/finders, people who can look around at problems and say, “I can do something about that” and who truly have the skills to do it. In the meantime, I’m doing what I can. 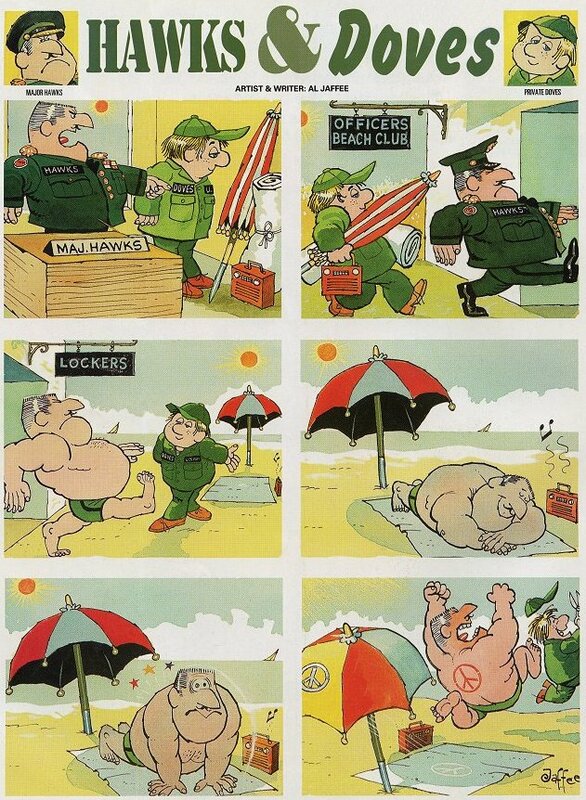 This entry was posted in History, Inspiration, Politics, Social Folly and tagged America, Change, Constitution, Immigration, Political polarization, Tradiition. Bookmark the permalink. Amen, amen, amen. If you were running for office in my area, I’d vote for you. I’m so tired of going to the voting booth and voting for the “lesser evil.” I’ve never been very politically minded. But I’ll keep voting and hope I’m making the right guesses. On another note, I’ve been watching the PBS series on Italian Americans and learned that they were being interred as well as the Japanese. At least those who weren’t born here and hadn’t become citizens. When enough of the right people became involved it was stopped. I think it bothers me more that I’m just finding this out than that it happened in the first place. Injustice needs to be dragged out into the light of day. Sorry, this really belongs in a different blog entry. Actually it’s quite relevant. The subject is vast, and this event plays a significant part in the overall drama.